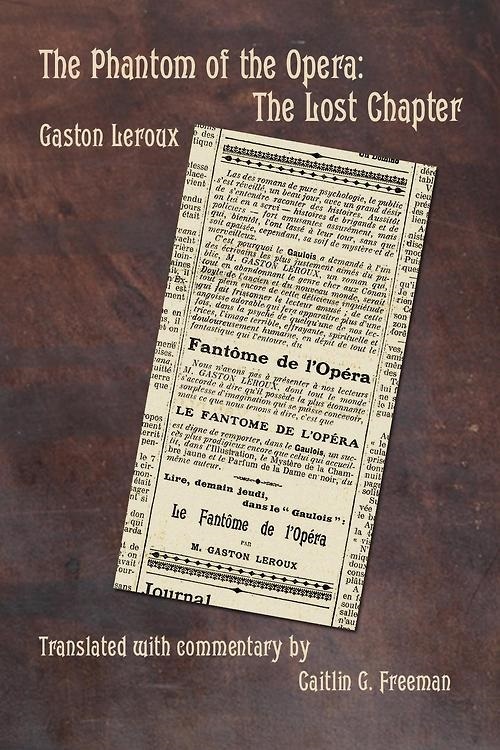 As you are now probably aware if you have looked at the original Gaulois serialization of Leroux's Phantom of the Opera (don't know what I'm talking about? click here), there was originally an additional chapter in the story that Leroux cut out when he prepared his book for publication. This chapter was called "L'enveloppe magique," or "The Magic Envelope." What? An additional chapter in Phantom of the Opera that we've never read, you say? Well, sort of. Leroux summarized this chapter at the beginning of "Mme Giry's Astonishing Revelations," however in doing so, he removed much of the whimsy and droll humor that makes this chapter so fun. I am undertaking to translate this chapter as part of my Phantom translation project (see here), and I will be posting my translation in this thread. I welcome any questions and comments about this translation, and I also look forward to discussions with people who can read the original French! I have finished writing out this chapter longhand (this helps me more quickly digest the text, since I am obviously not as familiar with this chapter as with the rest of the book), and I will begin my translation of it tomorrow. I will post my translation here as I go along. We will be anxiously awaiting! Showing here, as they say, ;)is the first section of my translation of "The Magic Envelope," the chapter from the Gaulois publication that Leroux omitted from his 1st Edition of Phantom. This translation is copyright 2013 by C. Freeman. Please do not reprint this without my written permission. If you go to the Gaulois publication here, I have translated from the beginning of the chapter up to the phrase in the third column: "Ainsi, ils évitaient d'éveiller sa méfiance, car ils voulaient le prendre sur le fait." This is an intermediate draft of this section (I'm still tweaking a few things, and digging in my dictionaries for translations of a couple of passages), so I welcome questions, comments, etc. Mama Giry had been reinstated in her duties. This is certainly not in the Memoirs of M. Moncharmin, although one can find evidence of so pathetic a capitulation before the occult force of the Phantom. Furthermore, whether he believed that he had been tricked by someone more cunning than he — and we shall soon see whom he at least momentarily suspected — or whether he was in truth ashamed to admit or suggest his managerial concern, Moncharmin spoke no more of the Phantom except in a vague, cautious, and frequently incomprehensible manner. On the other hand, one could not doubt that MM. Richard and Moncharmin, as reasonable people, endeavored to wake from the dream that had begun to take hold of them in Box 5 on that disastrous evening. The following day, they agreed to make it known that they had neither felt nor heard anything extraordinary in that infernal box, and the words that heralded the accident: “She is singing tonight to bring down the chandelier,” were to be regarded as just a trick of their overactive imaginations. All the same, they had a lengthy and secret discussion after a tempestuous visit to see the poor Carlotta, who had taken to her bed, unable to recover from her misfortune. And then they spent an entire afternoon in the rafters of the building. A careful inspection of the chandelier’s means of suspension left them rather puzzled, and that very evening, they sent their apologies to Mama Giry. They entreated her to resume the management of Box 5 and they resolved to enter into negotiations with the P. of the O. They deemed that they could devise no better strategy for overcoming this mysterious figure than by making him believe they were finally giving in to the explicit attempt at extortion inscribed in red ink in the Opera’s document of terms and conditions. As we can see, the Managers' frame of mind had undergone an important transformation. They no longer claimed they were dealing with a prankster, but instead concluded that he must be a crook with outrageous audacity. And they intended to catch him, the upshot of which were several incidents that were faithfully related to me by way of Mama Giry, then by way of Mercier, the administrator, and finally by Gabriel himself, the chorus master and confidant of Richard, as Mercier was that of Moncharmin. Mama Giry did not seem to have held any hard feelings towards the Managers for their regrettable behavior against her. Or at least, demonstrating great composure, she did not show any. She still wore her air of aloof dignity, as well as her shawl and her soot colored hat. When she had returned to her duties, Moncharmin coldly gave her a letter for the Phantom. She took it and calmly placed it in her basket, announcing that she would bring this letter to the Phantom that very evening. Needless to say, from that day onwards, the Managers no longer quarreled with their unseen guest over his box. The day after they wrote to him, they received his reply. The post office, in an utterly unsupernatural fashion, delivered his letter to them. “It seems to me that our Phantom has every appearance of ruining women’s reputations,” declared Moncharmin! But for the moment, they decided not to probe the mystery of that relationship. Likewise, they restrained themselves from keeping watch over Mother Giry, and so they were unaware of how she actually corresponded with their new “friend.” In this way, they tried to avoid arousing his suspicion, for they wanted to catch him red-handed. Thank you for posting this FdelOpera.... exciting isn't it! I've always wondered what to do with "Mame Giry"..... I am really not sure where "Mame" comes from. Leroux sometimes calls her Madame or Maman/Mère Giry, but more often than not, it’s “Mame”. Is this derived from “Maman”, and would perhaps correspond to saying “Ma Giry”? “Mame” feels a bit colloquial. Or is it a variation of Madame, giving us “Missus Giry”? It can’t be linked to the American “mammy” can it? I haven't found it in my dictionaries, anyway. And what IS it with that "chapeau couleur de suie"! Leroux just goes on and on about it! Or at least, he mentions it several times, the identical phrase. In The Magic Envelope, Leroux frequently refers to Mme Giry as Mam' Giry, and Mam' is short for "maman," so I've translated it as "Mama." I'm tempted to think that "Mame" (which he used in the 1st edition) is likewise short for "maman," and so would be translated in the same way. Speaking of Leroux being convoluted, I'm still researching Erik's phrase, "lustre et balustre" that he uses to threaten the Managers. It literally means "chandelier and baluster," but it feels like either an idiom or a literary reference (or both). Well, as well as a play on words, because Erik does seem to be threatening them with another chandelier crash if they don't pay him tout de suite. So far, I've at least tracked down the rhyme in poetry by Victor Hugo and Seigneur de Racan, though Leroux's phrase doesn't seem to relate to the context of either of these. Has anyone heard of "lustre et balustre" before? If so, I'm all ears! Here is the second part of my translation of “The Magic Envelope.” If you go to the Gaulois publication here, I have translated from, “Tout ceci s'était passé avant le bal,” in the third column, down to the end of the section, dated November 3, 1909. There are two more sections to go in this chapter, dated November 4 and November 5, respectively. More to come soon. Enjoy! “My dear Manager, I have deemed it best that we should discuss our business face to face; it will allow us to talk over these matters more easily, and I have resolved to confer with you personally, since you are a gentleman, a shrewd judge of character, and a person of the highest intellect, qualities that are greatly appreciated, and that I would be at pains to find in your unfortunate colleague. If you do not want anything untoward to occur between us, I cannot advise you too strongly to keep the plan that I shall reveal to you a secret. It is simple. Rest assured that I will not instruct you to bring the 20,000 francs with you. You would put me behind bars as soon as I had the money in my pocket, and then it is I who would be robbed. No, but I shall tell you in person and viva voce how you must go about getting me the money so that, each month, it reaches me without any risk, either to it or to me. M. Moncharmin did not inform anyone. M. Richard did the same as he. If through that experiment, P. of the O. had tried to determine the degree of influence that he exerted over the minds of the two Managers, he must have been pleased. His instructions were followed to the letter. At exactly a quarter past midnight, Moncharmin, wrapped head to toe in his monk's robe, wearing his cowl and his mask, entered the appointed box — below the Box of the Blind — and there he waited. Richard, likewise disguised beneath his cowl, met him there soon after. They stared at each other for a long while through the two holes in their masks, each convinced that he saw before him the elusive P. of the O. ... and they waited for the other to begin the conversation. In this way, they entered the manager’s office; Moncharmin closed the door and waited. Richard also waited. And this time, no voice seemed to take the initiative in the conversation. Growing impatient, Richard, being the more irascible of the two, was the first to break the infuriating silence. “We must put an end to this!” he cried. Hearing Richard’s voice, Moncharmin received a shock that sent him stumbling backwards. And then suddenly, he burst out laughing. And recognizing Moncharmin’s voice, Richard rushed over to the monk and threw back his cowl. His mask fell to the ground. There stood the figure of his colleague, who was laughing so hard that tears were in his eyes. “You are an imbecile!” Richard declared simply, throwing his mask on the desk in a huff. In the face of Richard’s genuine anger, Moncharmin, growing more and more bewildered, seemed to ponder something for a moment; then he took a letter from his pocket and held it out to his colleague. Richard took it, glanced at it briefly, and could not hold back a cry of astonishment. And from under his monk’s robe, he too produced the missive that he had received from P. of the O. * Translator’s note: This phrase is an almost exact quote from the introduction to the 1860 French translation of Lorenzo da Ponte’s Memoirs. Da Ponte was an Italian poet and opera librettist, best known for writing the libretti for three of Mozart’s greatest operas: Così fan tutte, Le nozze di Figaro, and Don Giovanni. Leroux’s phrase is: “élevant leurs mains en conque à leurs oreilles, comme pour mieux boire le vent de l'orchestre.” The phrase from the introduction to da Ponte’s translated Memoirs, written by A. de Lamartine, is: “élevant ses deux mains en conque à ses oreilles, comme pour mieux boire le vent de l'orchestre.” It is unclear why Leroux chose to use this phrase in this location. Lamartine was describing what he saw when he watched da Ponte listen to Italian opera: “cupping his two hands to his ears to better imbibe the thunder of the orchestra.” Leroux was describing opera enthusiasts who had been blinded from opium addiction doing the same. I can only think that Leroux simply liked the sound of this phrase and decided to use it here, and that there was no intended association with da Ponte, other than the general opera connection. Well spotted. Leroux really does seem to have lifted loads. I've found quite a few other sentences that are taken word-for-word from other books. Some of them are done tongue-in-cheek, but others are verbatim copies of old books and newspapers. Thank you for that note about the apparent quote, FdelOpera. Sometimes a phrase can stick in your mind and pop up for use on a certain occasion, this seems to have happened to Leroux. Jennie wrote: Thank you for that note about the apparent quote, FdelOpera. Sometimes a phrase can stick in your mind and pop up for use on a certain occasion, this seems to have happened to Leroux. I don't think that opium use actually makes a person blind, though perhaps it was a belief in Leroux's day? I'm not sure -- I still have to track that down. It may also have been metaphorical; perhaps the blind people just *looked* like opium addicts. In terms of "Monsieur," "M.", etc., I've decided not to translate any of them, but just to leave them as is. There is enough of a tradition of using "Monsieur" etc. in English translation and literature that I can get away with it. Mister sounds very, I don't know, American to my ears. Like, "Hiya, Mister!" It just doesn't sound right to use it in Phantom. Same for "Mme" and "Mlle" -- I could use Mrs. and Miss, but I don't think it works in this case. I'll have another section of The Magic Envelope to post soon! My task for this upcoming break is to search for a literary journal that will publish my translation of the chapter! Good excuse to talk to my uncle, the lit professor whom I haven't talked to since last Christmas. I've gagged over the phrase "leurs pensionnaires, mélomanes et extatiques, avec les figures passionnées et fatiguées d’amateurs d’opium", and went cross-eyed as I tried to translate it into another language. "their extatic music-loving inmates, with the passionate and worn/haggard faces of opium-users". It doesn't trot neatly off the tongue does it.... it's even harder into Swedish, believe me.... I don't think the inmates were necessarily drug-addicts, the turn of phrase may have been used because it gave a clear picture of what they looked like. ETA: I wonder if Leroux had Baudelaire sloshing around somewhere at the back of his mind. I'm excited to announce that I have finally finished and published my translation of "The Magic Envelope"! I've called it "The Phantom of the Opera: The Lost Chapter," since my (non-phan) family assures me that a general audience will not get the Magic Envelope reference. It is available digitally on Amazon Kindle and in paper copy on Amazon CreateSpace, and it will be available on the regular Amazon.com site later this week. I'll post the link as soon as it's up. Oh wow!!! Very cool, Caitlin! Congrats! I'll have to check it out. My translation of “The Magic Envelope” from The Phantom of the Opera is finally up on Amazon.com! I’ve also posted the translation part of my book online here. Oh well done FdelO! It looks great, you've really put your heart into this. I'll be back later for a more in-depth discussion. I had a few hours to myself today, and checked out your translation and book. It looks so good, I am totally in awe. I finished my own translation into Swedish during Christmas, but need to tidy it up, check up some question marks I have and generally try to make the text flow better. French is closer to English than Swedish, there are basic structural problems in sentence construction, and in parts it is so terribly clunky. I like how you've handled "lustres and balustres" - it's one of those places where you have to try to transmit the essence of meaning rather than translating the bare words. This phrase (along with quite a few others) have made me tear my hair. My latest whimsy is to say "chandeliers and catastrophies" (in Swedish) to make the hint of threats more clear, it's so subtle in the original French that I wonder whether it is indeed there, or if I'm reading too much into it. Do you have any idea why RIchard would mention Robert-Houdin? He'd died quite a few years earlier, and was at his peak mid 19th C - so why bring him up now? Were his shows at the Palais Royal extraordinarily expensive? Jennie wrote: I had a few hours to myself today, and checked out your translation and book. It looks so good, I am totally in awe. I finished my own translation into Swedish during Christmas, but need to tidy it up, check up some question marks I have and generally try to make the text flow better. French is closer to English than Swedish, there are basic structural problems in sentence construction, and in parts it is so terribly clunky. Yay! I am so glad that you've finished your Swedish translation! Let us know when and where we can purchase it. I look forward to reading it (I have a general familiarity with Swedish, although I don't speak the language). Yes, I am sure that it is easier translating from French to English than from French to Swedish, since nearly half of English is French in origin. As a Christmas/Chanukkah present this year, my dad bought me a copy of Il Fantasma dell'Opera in Italian (which I also speak), and I was jealous of how *easy* the translation process was from French to Italian. Aside from some idioms here and there that don't translate into Italian, the Italian version is remarkably similar to the French. Amusingly, though, the Italian translator didn't render the "Il avait un cœur à contenir l’empire du monde" correctly. He translated it as "Aveva un cuore capace di contenere il mondo intero," i.e. "He had a heart capable of holding the entire world." Instead of "He had a heart great enough to have ruled the world." So far, you and I and a couple of French speakers on Tumblr are the only people I've known who are familiar with the idiom "l'empire de" meaning control/mastery/rule over. Jennie wrote: I like how you've handled "lustres and balustres" - it's one of those places where you have to try to transmit the essence of meaning rather than translating the bare words. This phrase (along with quite a few others) have made me tear my hair. My latest whimsy is to say "chandeliers and catastrophies" (in Swedish) to make the hint of threats more clear, it's so subtle in the original French that I wonder whether it is indeed there, or if I'm reading too much into it. "Lustre et balustre" is probably the part of my translation that I struggled with the most. I rendered it relatively literally so as to keep the chandelier reference, but I have a gut feeling that there is a specific underlying idiomatic meaning that Leroux was intending. I've called in the big guns on this, and asked my uncle (a university English lit professor) to contact a few of his colleagues who are 19th century French scholars to see if they can track down the origin of the phrase (even if the answer is that Leroux invented it). I'd like to release a second more heavily annotated edition at some point, and hopefully be able to include a footnote that explains the phrase's origin and idiomatic meaning. Another phrase that I had trouble with was "F. de L'O. s'offrait plus particulièrement la «figure de Richard»". I finally found an old phrasebook from the 1920s that explained that "s'offrir la figure de quelqu'un" means "se payer la tête de quelqu'un," which means to make fun of someone. I'd heard "se payer la tête" before, but "s'offrir la figure" is apparently a more old-fashioned phrase. I chose to translate it as "P. of the O. was 'making sport' of Richard in particular" to maintain the old-fashioned feel. This was really as much a research project as it was a translation! Jennie wrote: Do you have any idea why RIchard would mention Robert-Houdin? He'd died quite a few years earlier, and was at his peak mid 19th C - so why bring him up now? Were his shows at the Palais Royal extraordinarily expensive? It's a good question. I don't know how much Robert-Houdin's rates were that he should be compared with someone who steals a year's salary each month! As far as mentioning him, it's probably to establish an "old-fashioned" context, since he would have been a magician that someone Richard's age would have remembered from his youth (Richard was about fifty when the novel was set). Oops, let you know when you can buy my translation? Well, yes, why not... I've been wondering what to do with it, so why not go the whole hog and follow your good example... It's been hard work, I've never really discussed Phantom in Swedish and am more comfortable with French-English-French than anything else. SO it's been good exercise for my brain. Oh that "empire du monde" phrase! One day we'll put that right, in English AND Swedish, won't we? When I first read "lustre and balustre" I started giggling - it was so melodramatic in a way, and just didn't make sense. A bit like Captain Haddock's "blistering barnacles" - that was a thought that ran through my mind. Please let us know if you find enlightenment somewhere. There have been quite a few expressions in Leroux that have seemed made-up to me, but have turned out to be perfectly normal.... well idiomatic anyway, Frrrench. Such as singing like a nail or breathing/wheezing like a seal. "S'offrir la figure de Richard" has tripped me up too. I've thought along the same lines as you, but am still poking around at that paragraph. Meh. As for the Robert-Houdin reference.... I wonder if it's all a part of the "image-building" or spin doctor work of Leroux. Houdin was a "prestidigitateur", a term Leroux uses several times in the book. Definition (copied from my Petit Robert) of the word: "artiste qui, par l'adresse de ses mains, produit des illusions en faisant disparaître, apparaître, changer de place ou d'aspect des objets". Ie someone who is nimble with their fingers and can make things disappear, reappear and change places.... Erik in a nutshell, no? ETA: pretty chilling this bit: "il est le prince des étrangleurs comme il est le roi des prestidigitateurs" from the Persian's description... He is the prince of stranglers, just as he is the king of sleights of hand/conjurers". Mind you, in Swedish it sounds plain silly: "Han är en stryparnas furste, precis som han är en konung bland trollkarlar", very bad melodrama. Re: Translation of "The Magic Envelop - l'Envelope Magique"
Wow! Awesome work FdelO! And huge congrats on actually getting it published! Rock on! :-) My French is pretty rusty, and my knowledge of 19th century idioms non-existent. But I think I can offer some help re the passage referred to above. First of all, the people brought to the "box for the blind" would have been called inmates because they would have lived in an institution which, in those days, would not have been that dissimilar from a prison. Second of all, I don't think he's actually referring to them being opium addicts, or on any other kind of drug that made them go blind. Rather, I think he's suggesting that the music itself was their drug - that it had a drug-like effect on them when they listened, sending them into an ecstatic state. It's a common myth about the blind that music inevitably effects us that way, and probably was in Leroux's time too. It's an interesting association to make, though, between music and a drug high, given how he also describes music creating a similar high-like ecstasy in Christine! Anyway, just my thoughts. Hope they help! Location : The Pantages Theatre Toronto! "This phrase is an almost exact quote from the introduction to the 1860 French translation of Lorenzo da Ponte’s Memoirs. Da Ponte was an Italian poet and opera librettist, best known for writing the libretti for three of Mozart’s greatest operas: Così fan tutte, Le nozze di Figaro, and Don Giovanni. Leroux’s phrase is: “élevant leurs mains en conque à leurs oreilles, comme pour mieux boire le vent de l’orchestre.” The phrase from the introduction to da Ponte’s translated Memoirs, written by A. de Lamartine, is: “élevant ses deux mains en conque à ses oreilles, comme pour mieux boire le vent de l’orchestre.” It is unclear why Leroux chose to use this phrase in this location. De Lamartine was describing what he saw when he watched da Ponte listen to Italian opera: “cupping his two hands to his ears to better imbibe the thunder of the orchestra.” Leroux was describing blind opera enthusiasts who resembled opium addicts doing the same. If Leroux did borrow this phrase from de Lamartine, it is unclear whether he intended it to bear any association with da Ponte, other than the general opera connection." Also, I referred to these blind patrons as "residents" instead of "inmates" because of the slightly more polite (if perhaps inaccurate) word that Leroux used: "pensionnaires," which translates as "residents" or "boarders." Jennie wrote: Oops, let you know when you can buy my translation? Well, yes, why not... I've been wondering what to do with it, so why not go the whole hog and follow your good example... It's been hard work, I've never really discussed Phantom in Swedish and am more comfortable with French-English-French than anything else. SO it's been good exercise for my brain. Just an update, my annotated translation into Swedish came out in April and the annotated translation into English is just finished. Hi FdelO, long time no see.... I hope however that you will drop by and satisfy my curiousity.... I'm wondering about something in your translation, and would appreciate your explanation of it... It's been interesting to study the differences in our two translations into English, mostly we seem to have had the same understanding of the text, even if the differences between the British and American shine through. Anyway, you write "brevity is the soul of wit". To me, that means something completely different. It uses "wit" in the sense of "intelligence/knowledge". "Wit" means both knowledge and humour. But in this expression from Shakespeare, it means knowledge/intelligence. Polonius tells Gertrude he thinks Hamlet is mad. I will be brief: your noble son is mad." Sooo..... to me, (being coloured by my British English background and the Shakespeare-laden upbringing), "brevity is the soul of wit" means "it's smart/a sign of intelligence to not be long-winded". Does it ring differently to Americans? Jennie wrote: Hi FdelO, long time no see.... I hope however that you will drop by and satisfy my curiousity.... I'm wondering about something in your translation, and would appreciate your explanation of it... It's been interesting to study the differences in our two translations into English, mostly we seem to have had the same understanding of the text, even if the differences between the British and American shine through. The reason why I chose a slightly less literal translation of the phrase, "les plaisanteries les plus courtes sont les meilleures," is that it is a French expression. I wanted to convey the words that Erik wrote in his note, but I also wanted to convey that he was using an expression. The closest English expression is "brevity is the soul of wit." Now, you are right that in Shakespeare's use, "wit" meant "intelligence" and not "humor," and that in this instance Polonius was telling Claudius and Gertrude that he would be brief in his assessment of Hamlet, since expounding at length would be the sign of a dull mind (which is of course Shakespeare being ironic, since Polonius is well known to prattle on and on). However, in modern use (at least in modern American use) "wit" in this phrase has become synonymous with "a witty statement," so that the phrase now also carries the meaning, "the essence of a witty statement [i.e. a joke] lies in its concise wording and delivery." This modern meaning was close enough to "les plaisanteries les plus courtes sont les meilleures" for me to use it, and therefore convey both the essence of the phrase, and its status as an expression. This is a great example of how the English language has changed over the years, and how words have taken on different meanings over time! Some expressions would be very strange if you translated them literally. If something is suspicious, an Englishman would say "there's something fishy going on". A Swede would say "there's a dog buried here" (här ligger en hund begraven), whereas a Frenchman would say that "there is an eel under a rock" (il y a anguille sous roche). Leroux has some expressions that may seem rather odd, but are in fact proverbs/generally accepted expressions, that need to be interpreted rather than translated - it's fascinating.